Nina Ivy and Tobi Bakre strongly believe that their fellow Big Brother Naija 2018 house Bambam “Oluwabamike Olawunmi” is FAKE and not being real. These two housemates strongly believe that Bambam is fake and not being her real self, they are of the view that she’s just acting up because she’s aware that there are cameras everywhere in the house. Nina was the first housemate to voice her opinion about Bambam during yesterday’s diary sessions, she told Biggie that Bambam looks at the camera every time she wants to speak. Nina was of the view that Bambam is fake and just acting up. Nina further added that when Bambam says 10 things or words, she has to look at the camera 9 times. Tobi has voiced his opinion about Bambam on several occasions insisting that Bambam is faking her personality on the show, he once again told Big Brother yesterday during his diary session that he thinks Bambam isn’t real. 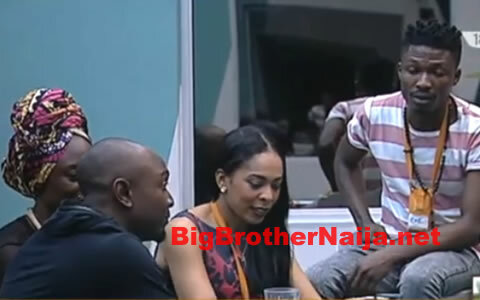 “Bambam is sketchy, I mean she’s not being real”, Tobi told Biggie. So what do you as the viewers think of Bambam, do you think she’s fake and just acting up or she’s being real? Please share with us your opinion by making use of the comments section below. tobi is still mad that bambam swapped tena and not him and alex.get over it tobi!! !